Good nutrition and academic success go hand in hand. Our team of food and nutrition professionals support academic success by providing healthy meal choices while promoting lifelong nutrition and fitness practices. PayForIt (PFI) is a Secure Online Payment system that simplifies payment, collection, and balancing of funds for school districts, enabling parents to pay fees and fund accounts quickly and easily online. To set up your child’s account for the first time, please refer to the PayForIt instructions. Set up your child’s account today! 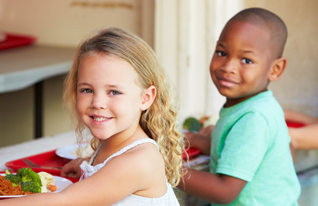 All of our school campuses participate in the National School Lunch Program (NSLP). The NSLP is a federally assisted meal program that provides nutritionally balanced, low cost, or free meals to qualifying students. The food and beverages we sell or serve on our campuses meet the state and federal requirements, which are based on the USDA Dietary Guidelines. If you think your family may quality for meal benefits, please complete a Free and Reduced Meal application from our office. We accept applications throughout the school year. We welcome your concerns, questions, and input on matters dealing with the USDA's National School Lunch Program. Feel free to contact Jeanie Morris, Food Service Manager, at (307) 436.7470.